For Blood and Thunder Magazine’s 2014 Roller Derby World Cup event, Field59 technology powered live online coverage of every match. Over the course of four days, tens of thousands of viewers from around the world watched four different Field59 streams in two venues in Dallas, Texas. 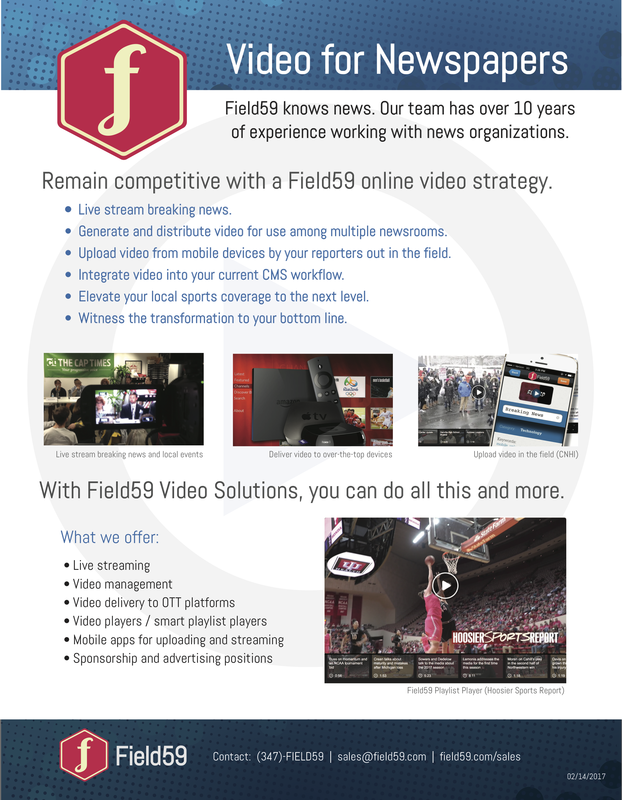 For the event, Field59 provided hardware encoders, its cloud-based live streaming platform, customized video player, and even a hosted web page. After the World Cup, Field59 provided video archive hosting of every match on the Roller Derby World Cup website. 70 matches over 4 days. More than 100 hours of streaming coverage. Nearly 12,000 unique viewers logged per day, with thousands more watching in large group viewing parties around the world. Viewers from 54 different countries. The Roller Derby World Cup needed to stream three tracks simultaneously, with a fourth track in a different location on the final day. Hinckley Productions needed to focus on video production without having to worry about hardware support or a streaming platform. The Roller Derby World Cup needed a player that would work with a paywall provider. The Roller Derby World Cup needed a website to host the stream for viewing due to concerns about high demand impacting its own site. The Roller Derby World Cup wanted to run sponsor videos during breaks in the action. The Roller Derby World Cup needed archives of the matches for post-event viewing. Field59 provided Hinckley Productions with four HP Proreliant Gen8 DL360e servers running Ubuntu Linux with Decklink capture cards, preconfigured with proprietary streaming software. Four live streams were provisioned in the Field59 Video Platform™. The video manager’s live event scheduling functionality ensured that the right streams were available to viewers at the right times. Field59 provided remote support for the servers once connected to venue’s Internet in Dallas. Our staff were available 24/7 for monitoring performance of the hardware, stream ingest, transcoding, delivery and communication with the Hinckley Productions team by phone, email, and text messaging. Field59’s domain restriction functionality in the video player configuration settings ensured the live stream players only loaded after end users logged in through Roller Derby World Cup’s paywall provider, Cleeng. Field59 built a web page to make all streams available for a user to choose which track they wanted to watch at a given time. Placing the page behind a content delivery network (CDN) ensured end users would be able to access the streams at all times no matter what traffic load. Due to the event’s popularity, there was enough traffic where the Roller Derby World Cup main website experienced difficulties itself, and for much of the event they redirected their main website to FIeld59’s streaming web page. Users went to the web page, logged in through the Cleeng paywall system, and then accessed the streams. Field59’s video stitching functionality allowed the Roller Derby World Cup to stitch video promotions from their sponsors directly into each of the four streams over all four days of the World Cup, to every device tuned into the live stream. This stitching was done automatically between bouts, and more importantly, without affecting Hinckley Production’s workflow. All Hinckley Productions needed to do was fade to black during breaks to trigger the sponsor content. Field59 recorded every minute of action, and viewers can access individual bouts on the Roller Derby World Cup website. The streams were a great success. Viewers around the world shared their excitement on social media using hashtags #RDWC and #RDWC2014. The Roller Derby World Cup is an international women’s roller derby tournament organized by Blood & Thunder magazine, a sports magazine devoted to coverage of contemporary women’s roller derby. At the Roller Derby World Cup, teams of amateur skaters from around the world compete for their respective nations. Multi-camera production was provided by Hinckley Productions. Hinckley Productions was established in 2005, and is based in Madison, WI. Hinckley Productions is an independently-owned, full-service studio specializing in creating video for online distribution. Their mission is to deliver original, compelling and cutting-edge work, and they’re committed to consistent, reliable video delivery with the utmost integrity. They set themselves apart with their experience in multi-camera broadcasting and by creating compelling brand stories.